Keywords: Histone acetylation, histone deacetylase inhibitors, anticancer agents, epigenetic, hematologic malignancies, solid tumors. Keywords:Histone acetylation, histone deacetylase inhibitors, anticancer agents, epigenetic, hematologic malignancies, solid tumors. Abstract:Acetylation and deactylation of histones are important determinants of gene expression. Histone deacetylases (HDACs) remove acetyl groups from histones leading to suppression and regulation of epigenetic gene expression. Current studies have demonstrated that HDAC-inhibitors (HDACIs) inducing histone hyperacetylation are promising novel agents in cancer treatment. HDACIs have been shown to have significant anticancer effects with negligible toxicity in the preclinical studies. Ongoing clinial trials are being performed to investigate the efficiency of HDACIs in human cancers. 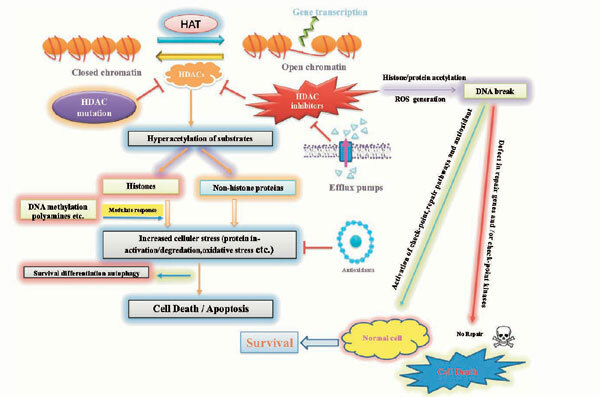 We have reviewed the current knowledge about the molecular mechanisms of action of HDACIs and the outcome of clinical studies using HDACIs in the therapy of several cancers.